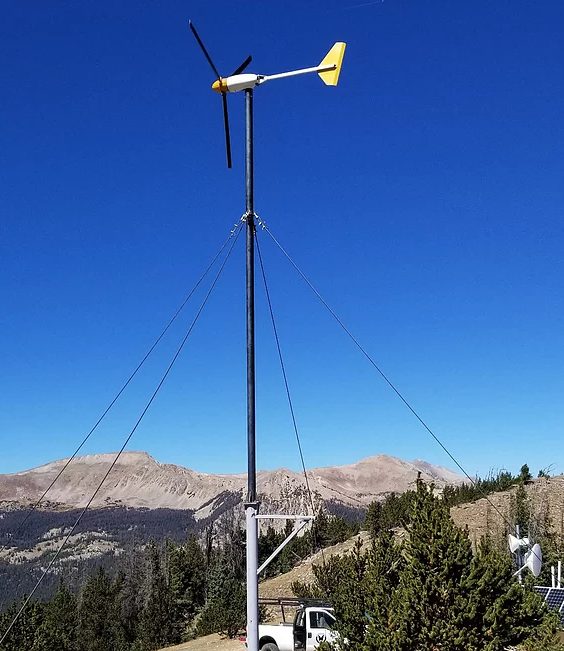 The wind turbine at our internet relay site on top of Monarch Ridge received some work this fall. The engineers that we collaborate with on this project suspected additional turbulence being placed on the system at its original design height. This was due to ground wind speed fluctuating as it passed over undulations in topography and vegetation. An extension of 15′ was fabricated to elevate the turbine into a more consistent wind pattern area. Four guy-lines were installed to shore up the structure. While the wind will still be ferocious on the ridge at times, we are hoping that this will help to alleviate damage events to this instrument. Solar panels generally collect enough energy to power the station 80% of the time. The wind turbine covers the energy needs for this station during the other times when it is cloudy or the panels are covered in ice or snow. The back-up generator is the last redundancy that covers periods when neither renewable energy source is supplying enough power to the system. Our IT and Vehicle Maintenance Department also replaced the entire battery stack at the station this fall.